blog What’s New in Axosoft Version 16.2? Audit Trails rebuilt to track more changes. For a full list of features and fixes please be sure to also review our version history. Also, if you are an Axosoft Installed customer, this version will include all the changes from v16.1 as well. Hover over a column in grid view to use a quick filter. Now we have expanded this quick filter to multi-select lists. Say you tag an item with several options in the your multi-select list. With this new feature set, you can filter down to a specific selection so you only see what you need. Yay filters! We made Axosoft a little smarter with this update. Select an item and then hit d on your keyboard. Use the keyboard shortcut “d” to modify durations. Now any time both fields are blank when you open a new or existing item, Axosoft will update the Remaining Estimate field when you enter a value in the Initial Estimate field. It will even update as you update the Initial Estimate field. However, if you explicitly state a value for the Remaining Estimate field then Axosoft will respect that data entry moving forward. Get a burndown chart that only displays work by the selected team. Now only items from members of the selected team will show in the burndown chart. What can I do with users now? Did you know that you could right-click on a user when you navigate to Tools/ People/ Users? As of version 16.2, you can multi-select users and right-click to make bulk changes. Activate, deactivate, or unlock multiple users at once. What other multi-select options are new? Do more in bulk. Limit of up to 100 items! Remember, when deciding between “Copy to” or “Move to” we always recommend defaulting to the copy option so you keep an original record. Where can I add a work log? It is now even easier to add to your work logs for a specific item. Simply navigate to your work logs tab, and right-click on an existing record to log more work. Right click on a record to get this menu. You can also use the keyboard shortcut W to add an additional work log for the selected record. 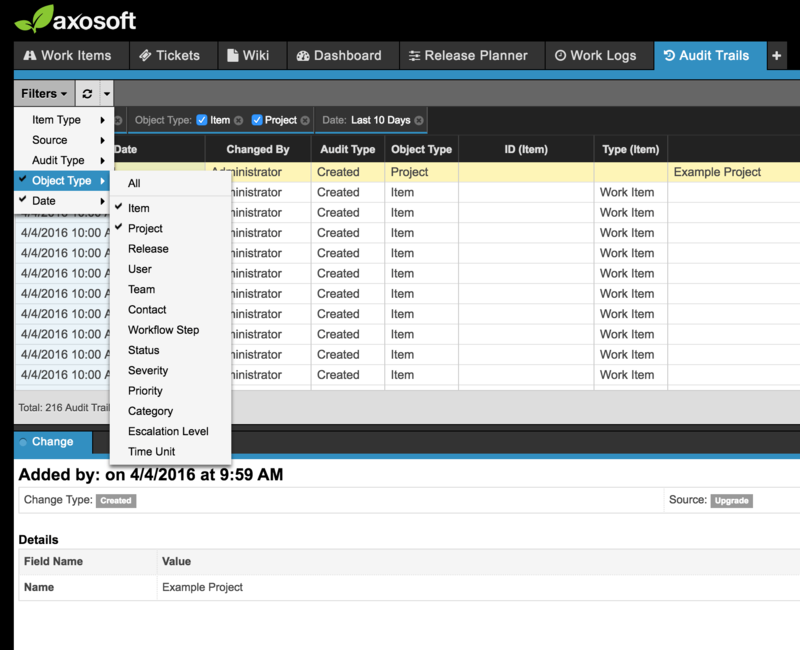 Access the Audit Trails tab to review item and object history. For now, system changes are limited to name changes. Don’t forget, you can also include item audits in addition to any system object updates. That about covers what’s new in Axosoft 16.2! If you have any questions, please don’t hesitate to reach out to your success team. What’s New in Axosoft v16.5? @Mentions, source control, and more! What’s New in Axosoft Version 16.4? An in-app tutorial and more!